Light can trigger coordinated, wavelike motions of atoms in atom-thin layers of crystal, scientists have shown. 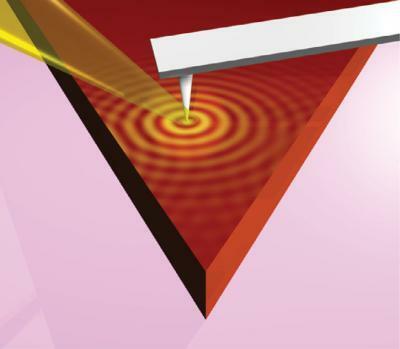 The waves, called phonon polaritons, are far shorter than light waves and can be "tuned" to particular frequencies and amplitudes by varying the number of layers of crystal, they report in the early online edition of Science March 7. These properties - observed in this class of material for the first time - open the possibility of using polaritons to convey information in tight spaces, create images at far finer resolution than is possible with light, and manage the flow of heat in nanoscale devices. "A wave on the surface of water is the closest analogy," said Dimitri Basov, professor of physics at the University of California, San Diego, who led the project. "You throw a stone and you launch concentric waves that move outward. This is similar. Atoms are moving. The triggering event is illumination with light." The team used infrared light to launch phonon polaritons across a material called hexagonal boron nitride - crystals that form sheet-like layers held together by the weakest of chemical bonds. Siyuan Dai, a graduate student in Basov's research group who was responsible for much of the experimental work and is the first author of the report, focused an infrared laser on the tip of an atomic-force microscope as it scanned across this material, registering motions in the crystalline lattice. This image shows surface phonon polaritons launched by infrared light propagate across layers of hexagonal boron nitride, a van der Waals crystal. "You can bounce these waves off edges. You can bounce them off defects. You can play all sorts of cool tricks with them. And of course, you can design the wavelength and amplitude of these oscillations in a way that suits your purpose," Basov said. This image shows interference patterns created by surface phonon polaritons propagating across atom-thin layers of crystalline boron nitride and reflecting back from edges. The center image is a model; images on the right and left derive from measurements.